The Metal Complex Second Skin Blog Hop! 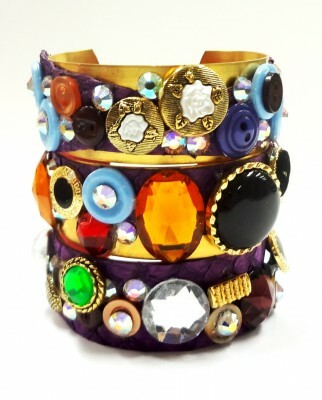 I have a post filled with wonderful wearable art today! 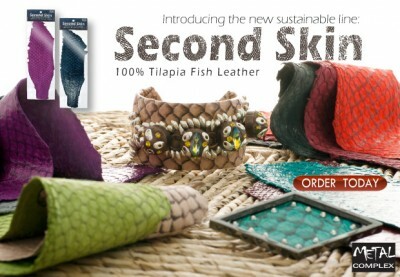 Welcome to the Second Skin Fish Leather blog hop! 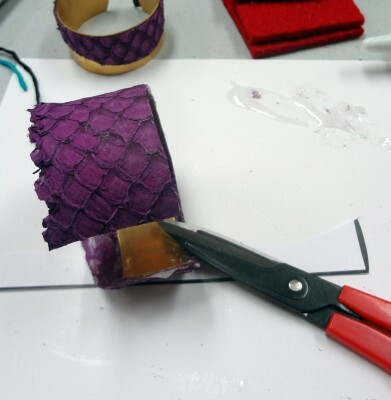 Eleven artists, jewelers and craftspeople were shipped one piece of Second Skin Fish leather along with a metal cuff and our Dazzle-it Leather scissors. They could do anything with what I sent! The results will astound you! Each image links to the artist’s own blog post. Many have provided wonderful mini tutorials! 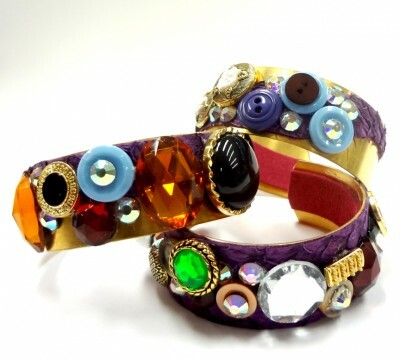 Lisa Kettell – Her variations will have you searching through your old jewelry stash! Charlotte Gordon applied colour and wiring in a way I would have never thought of! Michael Demeng created a wearable shrine! 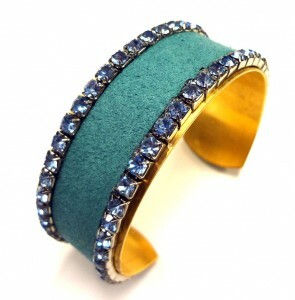 Andrea Matus DeMeng’s cuff is both delicate and exotic. She experimented with heating the leather. Laura Weed incorporated the actual image of a fish eye! She was not a fan of the leather when she started the project, but I think her finished cuff tells you that she found a way to love it! Suze Weinberg went wild! She made and wore her cuff the same day. If you go to her blog you’ll see the matching pendant/necklace she made as well! Lori Mendenhall incorporated components and findings that bring out the very best in the colour leather she received. Her colour palette is vintage and fresh at the same time! 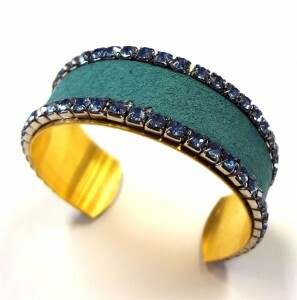 Bindy Lambell created a stunning cuff. Her leather colour is fabulously celebrated with this beaded cabochon! Vicki Boutin’s use of text imagery makes this cuff look like a secret message. I want to stop and read everything! June Beach has big and bold embellishments! Love those crystals! And finally, we have our own local crystal star Stephanie Dixon. Leather, metal and some very fine felt. She has sent us a video! I am going to try this idea next! Thank you so much to everyone who participated in this blog hop! Author Carmi CimicataPosted on February 27, 2013 November 9, 2018 Categories Brass Cuffs, Metal Complex, Second Skin Fish LeatherTags Blog Hops3 Comments on The Metal Complex Second Skin Blog Hop! These are the samples I made for the class I taught at the Craft and Hobby show in California earlier this month for John Bead. I gave each student a template of the brass cuff in paper. This made it easier to cut the fish leather. Leave at least ¼ of an inch of extra leather around the template. 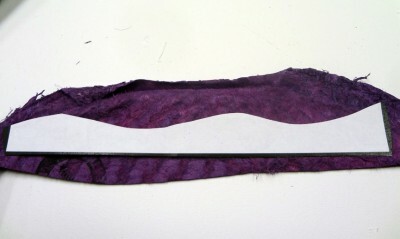 As an alternate, you could cut a piece of fish leather which has some unique curves. When glue has dried you can use your leather scissors to cut away extra leather from edges. You can also use your template to build/create your button design. 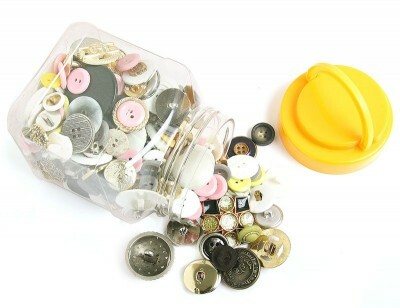 The buttons you will be using are plastic and the button shank is easy to cut off. 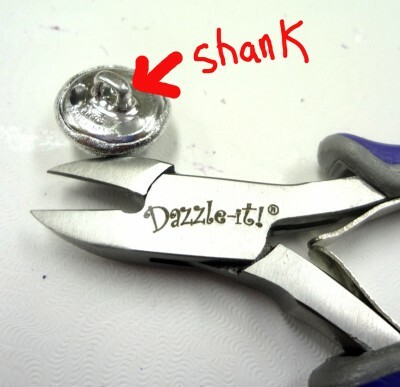 Cover the button when you cut so the shank doesn’t fly away…into anyone else. Glue your buttons to your cuff. 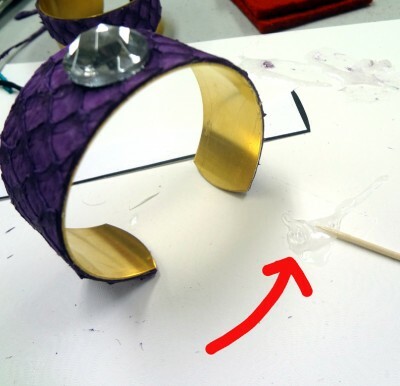 Take your time and allow the Quick Grip Glue to dry for a few minutes when adding layers and working on a curve. 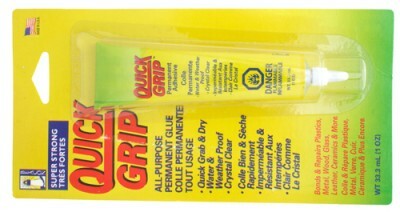 You can glue on crystals if you like or use your hot fix applicator to attach Preciosa Hot Fix crystals. 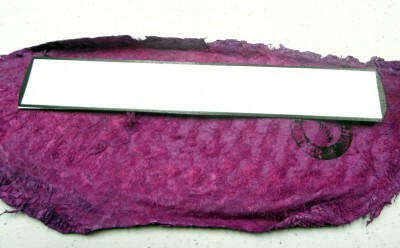 Your final step will be to glue your ultra suede strip to the inside of the cuff. What we used in the class. 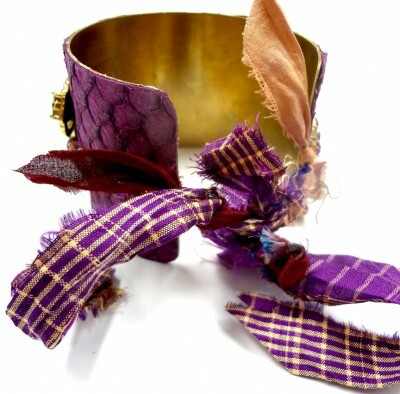 This is one of the cuffs I brought as a sample to my special cuff making class at CHA. 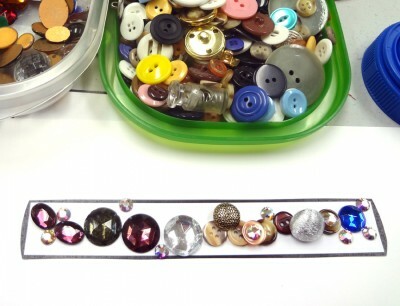 The buttons are the featured embellishments. I selected them from these special button jars from John Bead. 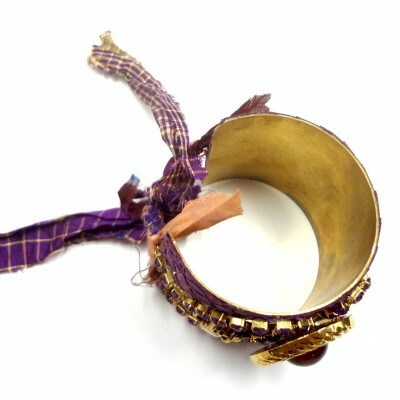 The metal cuffs are available in three sizes. 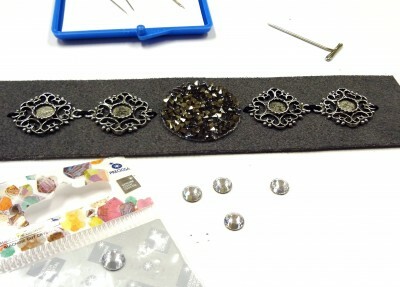 For this bracelet I used the 1.5 inch wide cuff. 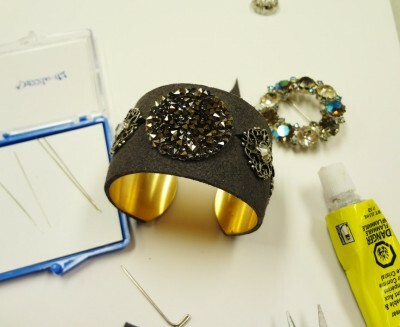 I glued some rhinestone chain to the cuff and it allowed me to attach ribbon to the edges. 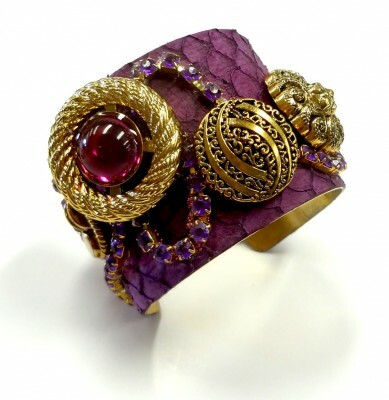 The fuchsia fish leather is what makes this bracelet look so rich. I used only one glue to attach everything! Quick Grip works beautifully with the leather! I have mentioned before that a brass cuff is just a blank canvas to anyone creative. This cuff was easy to craft. To start I gathered my main items; cuff, gray ultra suede, Quick Grip glue and some embellishments. 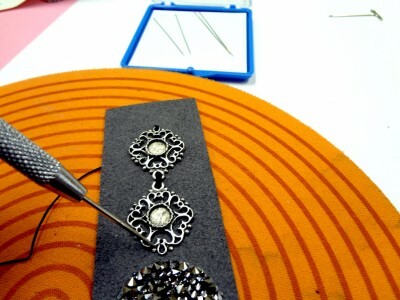 The filigree connectors can be used in many ways. I added a little glue to their backs to secure them in place. 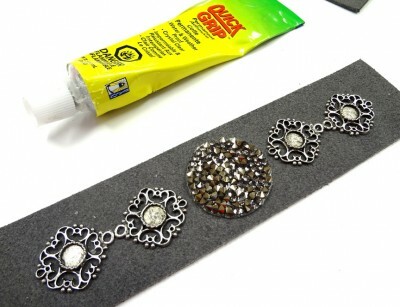 The SWAROVSKI Crystal Rock circle could be ironed on, but I chose to glue it in place as well. When my glue was dry I took the extra step to also sew my connectors in place. I pre-poked holes through the ultra suede to make this easier. My Dazzle-it needles and silk thread were ideal for my sewing task. I then added some Preciosa crystal flat backs for extra glitter. I then glued my ultra suede cuff to my metal cuff. The added stitches will ensure my connectors do not pop off on the curved edges. Later, I wire-wrapped a vintage brooch to my cuff. Options are endless! 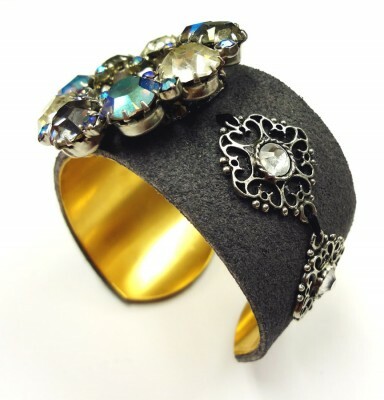 The current issue of Perles et cetera magazine has another cuff Idea I designed featuring feathers and a button. Just when you thought you saw it all, Metal Complex’s Second Skin’s 100% Tilapia Fish Leather hits the do-it-yourself market! This groundbreaking and sustainable material Second Skin is perfect for making bracelets, necklaces, earrings, shoes, and all kinds of leather goods rich in texture. There are 10 fantastic fashion colors in leather and suede and they work beautifully teamed with Ultra Suede , Brass Cuffs, and Bezels. When purchasing any type of leather including our Second Skin Fish Leather, make sure you have the best Leather Scissors that provides a clean and professional cut. Author Carmi CimicataPosted on November 21, 2012 Categories Bezels, Brass Cuffs, Metal Complex, Second Skin Fish Leather, ToolsLeave a comment on Fish Leather Is Here! This new cuff has only three components. One of the new Metal Complex brass cuffs, an ultra suede strip and some rhinestone chain. 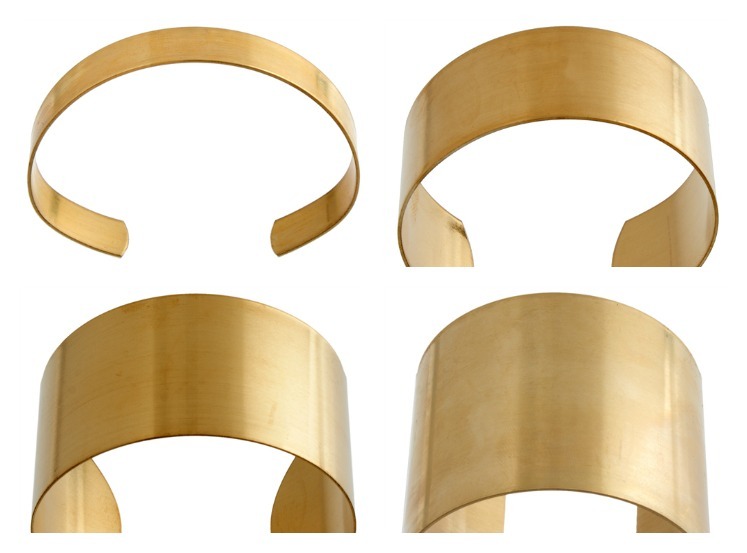 The new cuffs are available in four sizes: .44, 1, 1.5 and 2 inches. I have really enjoyed working with the new ultra suede cuffs/strips. They made this project look so professional with very little work on my part. 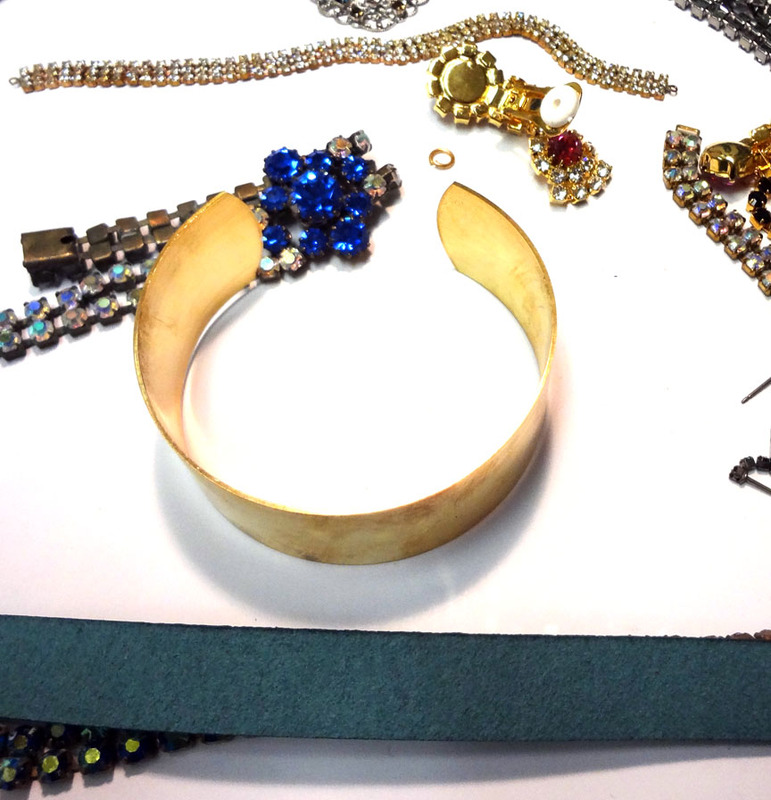 I have pulled out all my broken and unloved jewelry for my brass cuff projects this month. I am very happy to report that Quick Grip was the only glue I needed to securely attach both the rhinestones and ultra suede. This is cuff project one. Simple and elegant. Now I’ll move on to gluing other things to the brass! 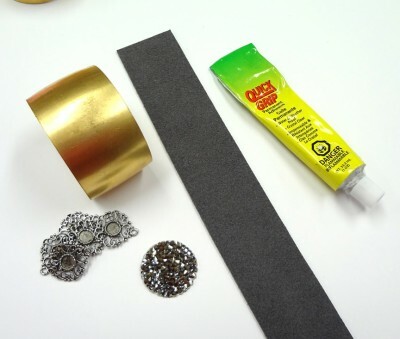 Author Carmi CimicataPosted on August 23, 2012 Categories Brass Cuffs, Glues, Leather and SuedesLeave a comment on New Brass Cuff Bracelets!